You’ve found your partner, now it’s time to find the ring! Where to start? If you’re like most, an engagement ring will be the first diamond you’ve ever purchased. Given your excitement and anticipation, this process might feel a little overwhelming. 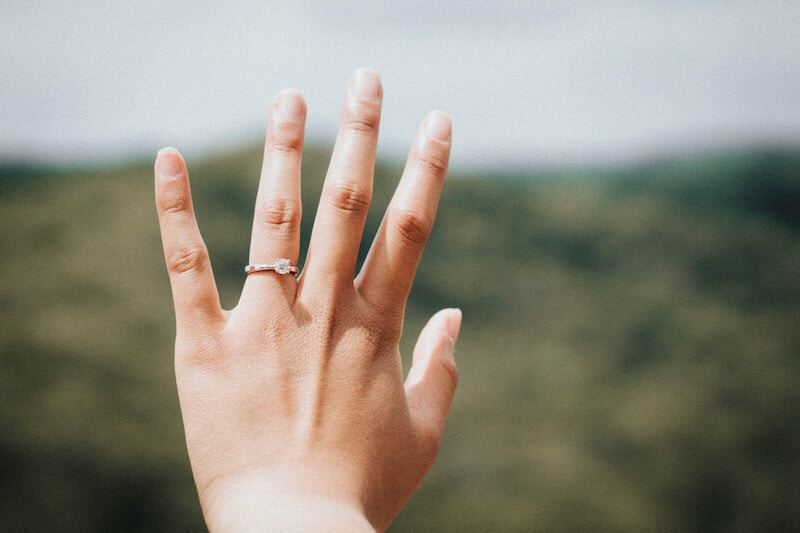 Our team at Malka Diamonds has created this guide to help answer all your questions about buying a diamond engagement ring. Use this article as a reference or give our Portland jewelry store a call! We’d love to discuss your needs and provide helpful feedback during this exciting time in your life. Before diving into your search for the perfect ring, take time to get a handle on your budget. What are you able to afford? Is your budget strict or flexible? Are you hoping to pay for your diamond up-front or use financing? Answering these questions ahead of time will help you and your jeweler find the perfect ring. Of course, if you’ve never purchased a diamond before, you may have no idea how much you should plan to spend. Recommendations or “rules” on how much you should spend on an engagement ring vary wildly. Rather than basing your decision on what you find online, we recommend meeting with an experienced jeweler. Your jeweler will help you understand the cost of a diamond, can compare diamonds with you, and will answer any of your questions. Remember that setting your budget is a personal decision. The amount you spend should be 100% up to you (and your partner). Always work with a jeweler who is more than happy to accommodate your budget and has a variety of rings to choose from in your price range. A diamond ring is a big purchase. The store you visit will make all the difference in the experience you have and your ability to find the best ring. As you begin looking at rings, one of your first decisions will be deciding if you want a vintage ring, designer ring, or a custom ring. Every couple is different, and the type of ring that feels right will always be the right choice. Here’s what to know about each type. There’s nothing quite like a stunning vintage engagement ring. A vintage ring gives you the opportunity to embrace a timeless style and continue a ring’s history and heritage. Most vintage rings need time with a gemologist to restore the original look of the ring. Ensure you’re working with a jeweler who carefully curates their selection of vintage diamond rings and can tell you about the era of the ring. Some couples prefer a modern engagement ring setting. These rings come from top-selling jewelry designers in the world and will take your breath away with their expert craftsmanship and beauty. A custom ring offers the chance to create something truly one-of-a-kind. This is your chance to give your partner a ring fully customized to your style and personality. If you are interested in a custom ring, make sure you work with an experienced jewelry who can translate your vision into reality. What Diamond Shape Should You Choose? The shape of a diamond makes up a big part of the look and personality of your ring. If you don’t know which shape your partner likes, it may feel like a tricky decision– there are just so many to choose from! However, there will likely be one or two shapes that catch your attention right off the bat. Listen to those instincts! Here’s a great chart to help you understand more about some of the most popular diamond shapes. This can be helpful in identifying which shape best describes your relationship or style. Carat– The carat of a diamond is its weight. Every carat is made up of points. 100 points equals 1 carat, and 1 carat is equal to 0.2 grams. Color– The less color a diamond has, the more valuable it is. The color scale starts at “D”(a completely colorless diamond) and tops the color scale at “Z”. The color of a ring is difficult to pinpoint. A trusted jeweler will provide a set of benchmark stones (also called master stones) to compare with the diamond you’re grading. Clarity– The clarity of a diamond is the amount of inclusions and blemishes found on a ring. Note that a ring without any marks is very rare and highly valuable. Cut– The cut of a diamond refers to its symmetry, proportioning and polishing. This 4-part system will help you identify a diamond’s best qualities. An experienced jeweler can guide you through the process of evaluating the 4 C's of a diamond and answer all of your questions. Don’t be afraid to ask questions. In fact, talking to your jeweler and asking questions is the best way to ensure you find that dream ring and are working with the right jeweler. Purchasing an engagement ring is a big decision, but it doesn’t have to be a stressful one! Here at Malka Diamonds, we think there’s nothing quite as exciting as choosing a ring for your partner. We want you to look back at this experience in a positive way. Our goal is to help you walk away with a ring both you and your partner will love for years to come. If you are ready to start looking for that perfect ring, visit our store in Downtown Portland! Or give us a call at (503) 222-5205 if you have questions. We’d love to hear from you!